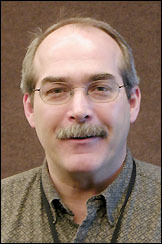 Scott Crawford is the new facilities manager for the Paynesville Area Health Care System (PAHCS). Scott Crawford is the new facilities manager for the Paynesville Area Health Care System (PAHCS). His duties include overseeing the maintenance, groundskeeping, laundry, and housekeeping departments for PAHCS. Crawford replaced Gene Martinson, who retired in December, and actually started at PAHCS in August to allow for a smooth transition. Before accepting the position in Paynesville, Crawford worked for Philips Medical Systems designing and coordinating the installation of diagnostic equipment. Prior to that, he worked at North Memorial Hospital in the Twin Cities and for the Alliance Health Care System. While he enjoyed working with medical equipment, he longed for a position that would allow him more contact with people, he said. He believes his position at PAHCS will fulfill that wish. After spending a few months on the job, Crawford believes his biggest challenge will be coordinating efforts to ensure that all of the facilities' needs are met. Crawford has also been on the job long enough to realize that the people he works with are really great, and the working environment is wonderful, he said. Currently, Crawford lives in Buffalo, but he's looking for a home with acreage near Paynesville that he can share with his four kids. For fun, Crawford likes watching his kid's high school sports, participating in water sports, hunting and fishing.